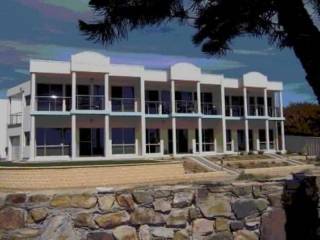 This is a rendered beach house, fully self contained on beautiful Port Noarlunga beach on a no through section of the Esplanade containing less than 10 houses. Built approximately 60 years old a modern open plan interior and nearly floor to ceiling windows provide magic views and a modern decor. The house has been tastefully furnished to be a home away from home. There is 1 bedroom available offering a queensize bed. All towels and linen are provided. 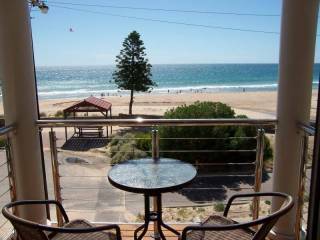 Located in a very quiet private section of the Esplanade overlooking beautiful Pt Noarlunga Beach, jetty and reef and only a 5 minute walk along the beach to Southport Surf breaks. 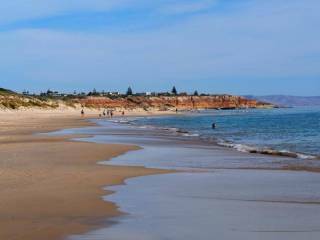 It is a 5 minute walk to township cafes, restaurants and the Pt Noarlunga Hotel. The property is elevated above the road and extremely quiet and private but only a 50 metre walk to the sand. There is a large heated outdoor spa and an open fire for use in winter. The kitchen, lounge dining room and bedroom have expansive magnificent beach views. All the front windows are tinted for your privacy. Minimum 1 week booking December and January, and 5 nights all other times. No refunds for cancellations made after payment is made.